BlackBerry offers glimpse of BB10 to Android and iOS users | Android Blast! In an effort to attract users from other platforms to BlackBerry, the company is offering a glimpse of BlackBerry 10 via your mobile browser. If you have an Android or iOS device, you can point your mobile browser to blackberry.com/glimpse to try out BlackBerry 10 for yourself. Once the page loads a green arrow prompts you to swipe up. The website then guides you through a BB10 walkthrough with a series of green prompts so you can try BB10 for yourself. The experience works very well on an iPhone 5. 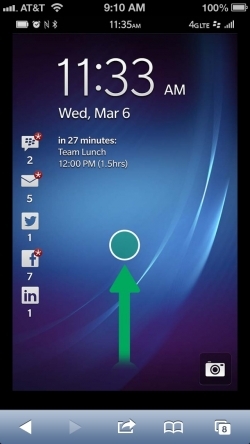 BlackBerry 10 is gesture based and feels reminiscent of webOS. If you haven't tried BlackBerry 10 for yourself, head over to blackberry.com/glimpse and try it for yourself.